INTRODUCTION Virtual reality (VR) simulation has been beneficial for the training in interventional endoscopy and minimally invasive surgery. Ex-vivo tissue simulators have been developed for the simulation of Natural Orifice Translumenal Endoscopic Surgery (NOTES). The aim of our study was to perform a structured needs analysis to identify critical design parameters for a virtual reality NOTES simulator. After securing IRB exemption, we distributed a 30-point questionnaire at the 2011 Annual Natural Orifice Surgery Consortium for Assessment and Research (NOSCAR). The questions covered a variety of topics: procedures, devices, endoscopic equipment, and training. A total of 22 NOTES experts completed our survey (17 surgeons, 4 gastroenterologists, 1 thoracic surgeon). Statistical analysis was performed using the Wilcoxon rank sum test. Among those surveyed, the most commonly performed NOTES procedure in humans is currently cholecystectomy followed by colectomy and appendectomy. When given a choice of procedures to be simulated in the VR environment, the majority of participants chose cholecystectomy (CE, 68%) followed by appendectomy (AE, 63%) (CE vs. AE, p=0.0521). For NOTES appendectomy, participants would prefer to perform the surgery using flexible instruments (FL, 47%) or as a hybrid procedure (HY, 47%) using only rigid instruments (RI, 6%) (FL vs. RI, HY vs. RI, both p<0.001). As preferred access route for NOTES appendectomy, 65 % of the participants chose the transvaginal (TV) followed by the transgastric (TG, 35%) approach (TV vs TG: p=0.52). There was no preference for the brand of endoscope for the VR-NOTES simulator (85 %, p<0.001), Although most of the participants preferred a two channel endoscope (2C, 65 %) as opposed to single channel (1C, 17 %) and three or more channels (3C, 17 %) (2C vs. 1C and 2C vs. 3C, both p<0.001). On a five-point Likert scale, participants rated force feedback and torque as important (table 1). Our analysis reinforced the importance of developing a VR simulation environment for NOTES. The VR platform should simulate cholecystectomy and appendectomy using both flexible and rigid instruments. The results of this analysis will direct our initial development of a VR NOTES platform. 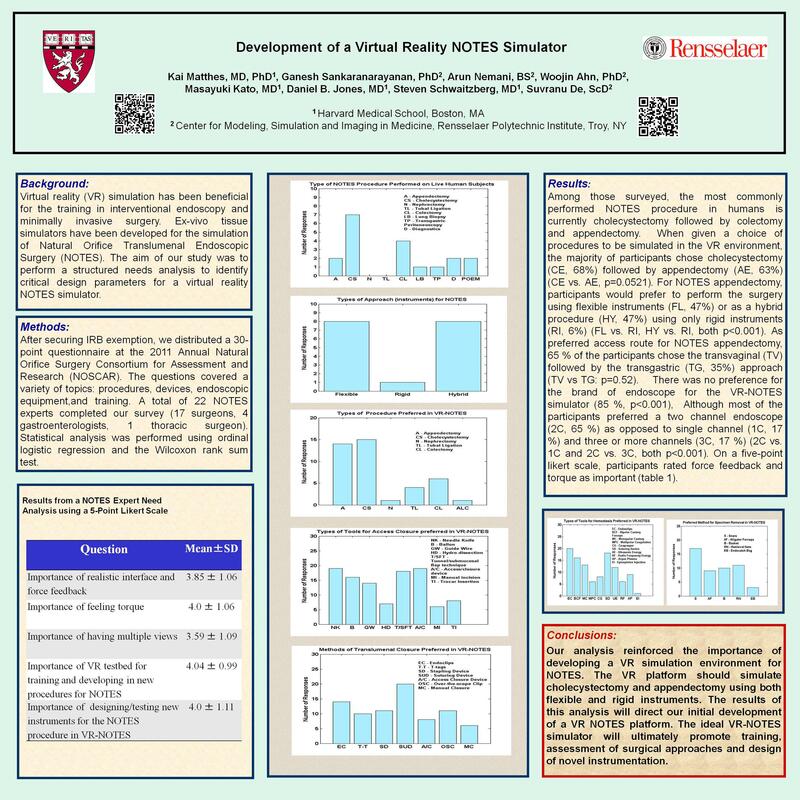 The ideal VR-NOTES simulator will ultimately promote training, assessment of surgical approaches and design of novel instrumentation.